Lost Souls Band from Butler, Pennsylvania. These awesome rockers and local music legends perform originals and covers. Lost Souls play classic, modern alternative rock, and anything in between, that will move your soul. These guys have an amazing rock 'n' roll talent and put on an astounding performance. Next Show - Saturday, 12/29/2018 - Lost Souls Band and Order 66. Please welcome our new drummer Thomas Wilbert to the band. He is going to bring a lot of energy and excitement to the live shows! Listen to Lost Souls Music, Leave us a message, or hire our band for a gig. Longhorn Corral this Saturday. Big party: We are welcoming Brad Tarcha to the band on bass. It is his second gig but come on out and help welcome him to the band with us. Thanks! 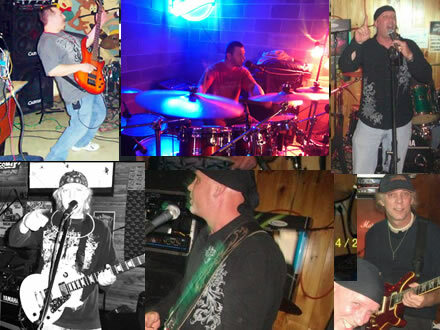 Donna Mae Anderson Benefit - Saturday, 10/09/2010 at Snowmobile Club in Hilliards was a great success. We helped raise $4400.00 for the benefit. Greg and Tammy got to meet Warren Haynes from Gov't Mule! Lost Souls Band Pictures are up from the Longhorns show with the girls that flew in from Chicago to see the band. Everyone please welcome to the band, Bruce Goettler on Drums and Ritchie Bernard on Bass. Lost Souls rocken longhorns from the first show. Band bios coming next. 08/26/2009 - Listen to Lost Souls Music for free! Lost souls band finished mixing the music to Enter Sandman from Metallica. This version and cover tune was recorded back in 2005 with Joey Sewanich on drums, one of our life long friends from Canada. Lost Souls Band will be at the Belmont 2 bar on Friday June 26, 2009 and outdoors at the High School for the Cancer Walk on Saturday June 27. You can find more info on our Gigs page. Ok everyone, we uploaded some new "old music" and you have to check this song out. Go to our sounds page and listen to "Ashes to Ashes" and make sure you check out our lyics for it too. Lost Souls has a couple new songs for you to check out. Take a browse at the updated song list by visiting the covers link. The band is working on more new songs and will keep the house rockin with some new material in 2009. Check out the Lost Souls Music Videos. You can watch the band's video's for free. If you attended a lost souls concert or at one of the bars we played, you might be in the bands video. So, what is today's assignment? Simply tell ten friends about Lost Souls Band. It's that simple. Just Direct them to this website. Or if you wish to contribute to the word-of-mouth marketing that is so beneficial, let Lost Souls know. Lost Souls Band - Pittsburgh Rock Music - LostSouls is rapidly becoming one of Butler / Pittsburgh finest live bands around. If you want to hire our rock band for a show and have live music entertainment, please visit our contact page. Mix Notes - Recording and Live, "05" Greg's new Mesa Boogie Road King rocks. Jeff's accepting donations for his! Listen to Mama I'm Coming Home on the Music page and you will here it! I think Ozzy and Zakk would be proud of it! Download Original Music from the band Lost Souls. Free Music, new mp3 songs have been added. Original music with tab and covers! Copyright © 2001-2015 LostSoulsBand.com. All Rights Reserved.